Size: up to 6 inches (15 cm). pH range: 7.5 to 8.5. Temparature: 75 to 82F (24 -28C). Color: white underbelly and yellow/green top covered in black spots, this top coloring ranging from dark green to fluorescent green to yellow. Very thick set and shaped, protruding eyes and very broad forehead. Fan shaped Caudal fin and no Ventral fins. The body covered with small spines and leathery texture skin. Puffers are of the family Tetraodontidae, meaning four toothed. They have a club-shaped and unarmored body. 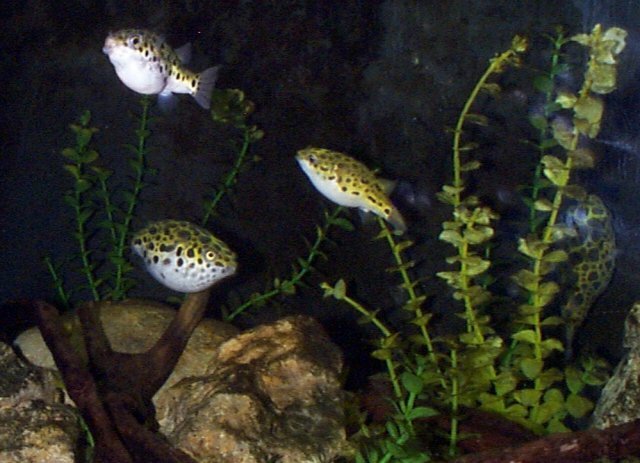 Green Puffer is a freshwater to light brackish species inhabiting rivers, lakes and flood plains. It is mostly carnivorous (mollusks, crustaceans, invertebrates) and also will eat vegetation. Generally a peaceful fish, but as it gets older it can get more aggressive, especially, when harassed by potential predators and a notorious fin-nipper. 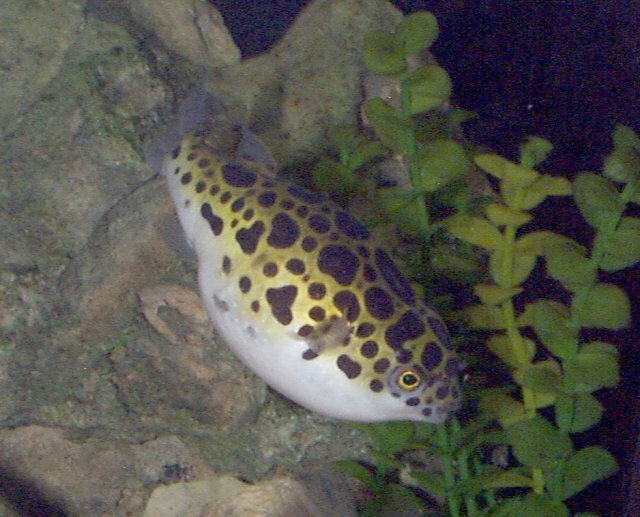 Green puffer with a smooth belly is very popular, it is often confused wity t. nigroviridis, and also t. schoutedeni, which are more club-shaped. 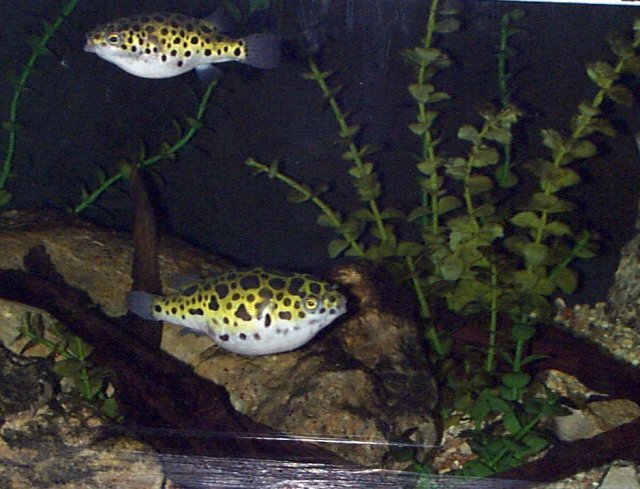 The green puffer exhibits a torpedo shaped body, with a longer sloping head and back region. The pufferfishes are unique in that they are able to inflate predators, making them at least twice as big. They do this by sucking in and retaining water or air in their bodies. Puffers have a pair of sharp front teeth which resemble a parrot's beak, and enable them to crush the shellfish and crabs they usually feed on. Pufferfishes themselves should not be eaten for they often contain a virulent toxin in their tissues. Usually seen at aquarium when they are small, they can grow to 4-6 inches and do some serious damage to most fish. Therefore, these fish should be keep in small groups. The female lays a clutch of 150-200 eggs onto a flat surface and the male guards them until hatched. 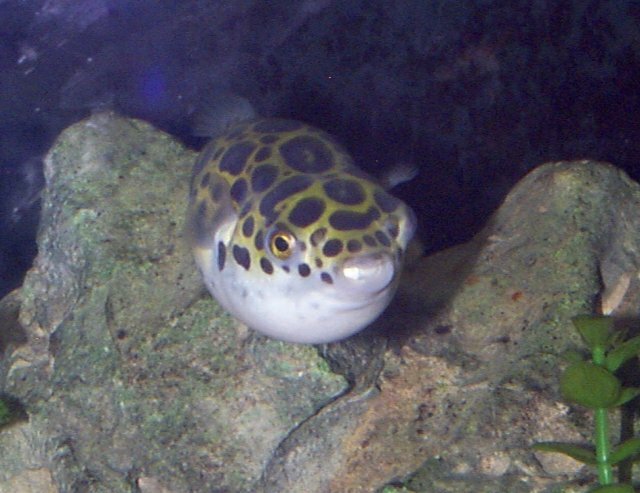 The young green puffers in the Fort Worth Zoo aquarium can be discribed as cute and docile. 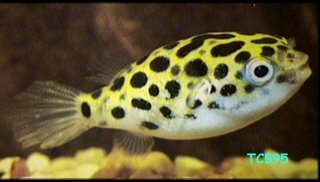 The spotted puffer's body conforms to the standard puffer shape with a white underbelly and yellow/green top covered in black spots. This top coloring ranges from dark green to fluorescent green to yellow. Their eyes are an almost metallic blue and appear to reflect light.